Trends in home design can be helpful for determining the current and consistent tastes of homeowners. 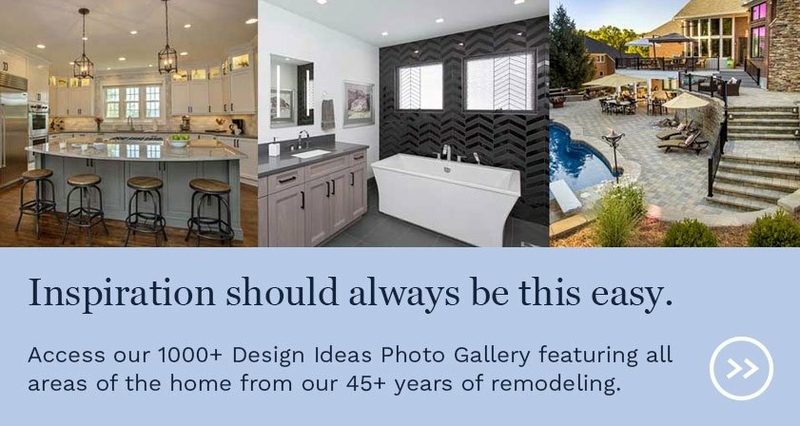 While some trends can be very specific to style, region, or budget range, other trends can be used as a starting point for planning your home remodel. While trends in other areas, such as fashion, revolve fairly quickly, home design trends have sticking power simply due to their very nature. Trends, particularly in the "background" materials like flooring, can provide great inspiration and still not end up being a "trendy" choice in the long-run. 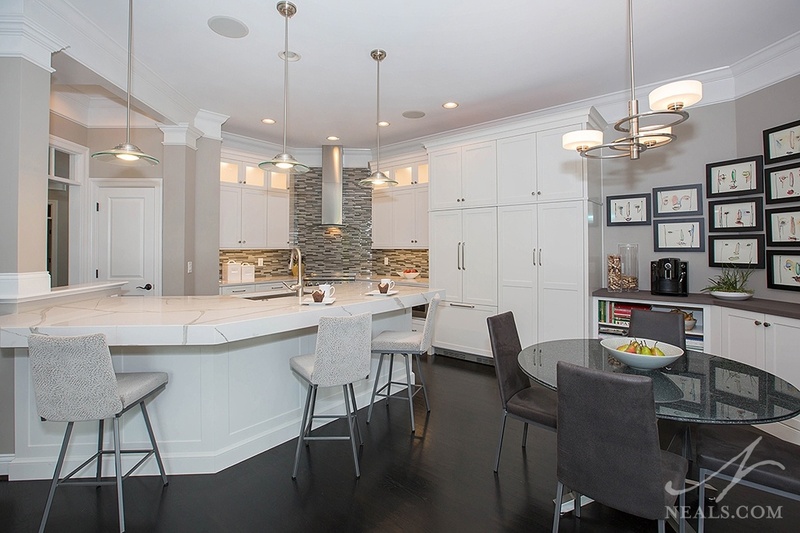 Keep reading for six trends in kitchen flooring we've been seeing in our Greater Cincinnati projects. 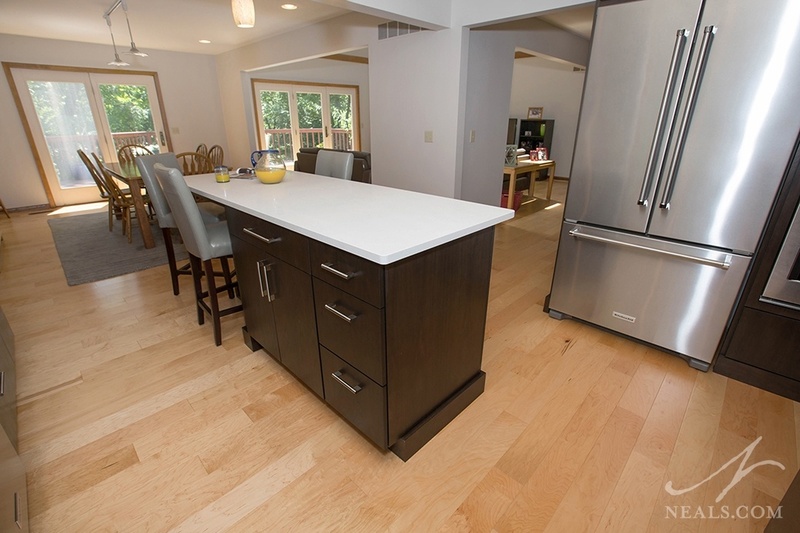 Mixed-width flooring used in this Sycamore Township kitchen remodel. Several wood floor manufacturers are now offering the option of various widths for their floor boards, rather than a single, standard board width. The overall look this creates is not at first obviously different from the standard widths, but the mixture does change up the color and pattern in a less-regular fashion, which adds interest and character. Mixed-width works well for most types of finishes and wood types, but keep in mind that however colorful or variable the planks are in general will only increase with the varied widths. The floor in this Anderson Township kitchen is wood-look tile set on a diagonal. 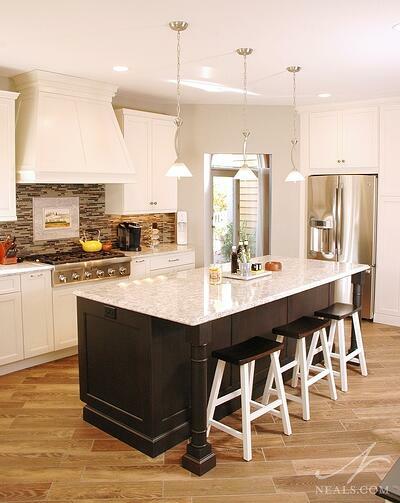 Some homeowners prefer tile in the kitchen, rather than a wood floor, but still like the look of wood. 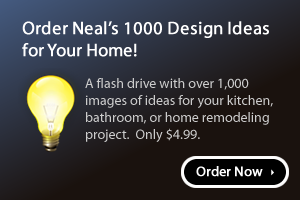 We've seen wood-look tile rise in popularity for the past few years, and have used it for a variety of home projects. Wood-tile products come in several colors and textures, just like wood, so there is likely a match for most projects. The only giveaway when you first see the floor will typically be the grout lines, which can be minimized or highlighted, depending on your taste. 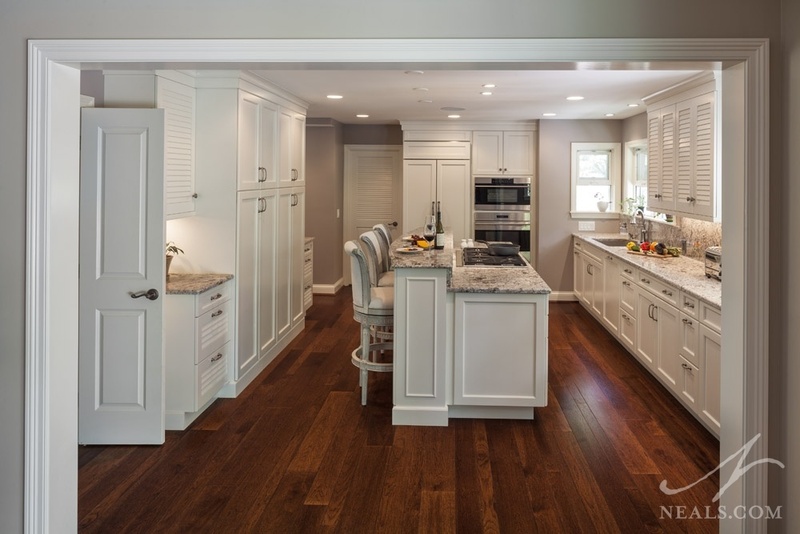 The dark cabinetry in this Cleves kitchen is offset by the blonde wood flooring. There was a time when light-toned, or blonde, wood flooring went out of fashion, but it's now making a rather noticeable comeback. A blonde wood is any wood that falls in the light range of finishes, but not so far as being gray or whitewashed. A blonde floor works well to contrast darker cabinets, but it can also be used in a white kitchen to keep things bright. With it's comeback, blonde flooring also proves that it can be timeless and classic, instead of trendy. 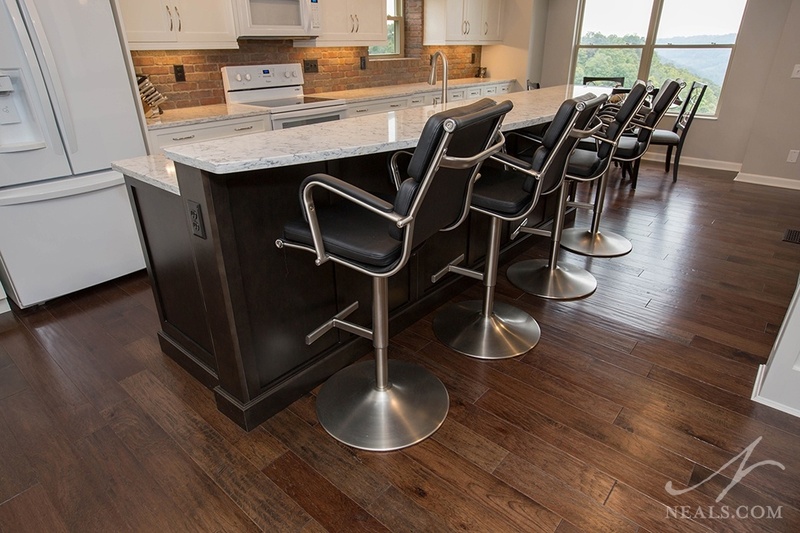 On the opposite end, dark-toned flooring is also seeing popularity. 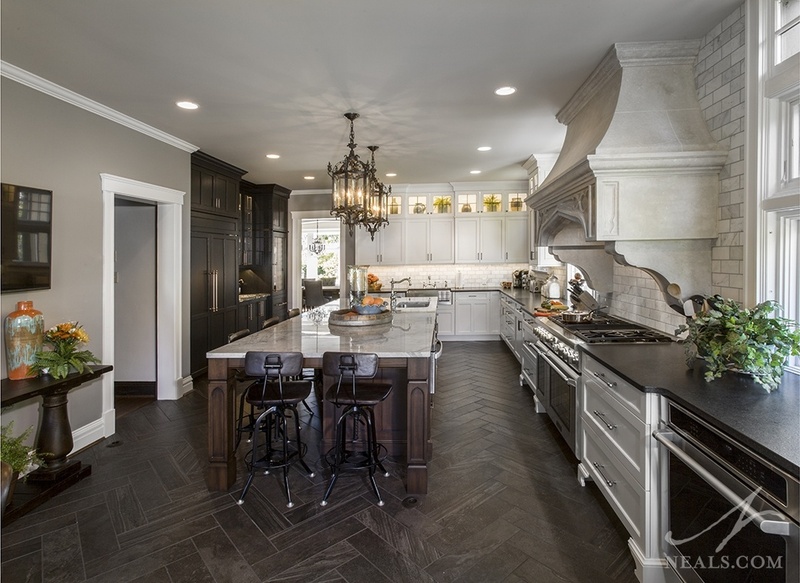 A dark floor can create drama and add a luxurious feel to the kitchen. Paired with white or light cabinetry, the resulting high contrast space is a very modern take on a classic black & white color combination. Dark floors can be achieved with any materials, but a deeply stained wood recalls the richness and patina of Victorian era design, which can instantly add a glamorous and historical touch to your kitchen. While it does add to the labor involved, arranging your flooring material in a herringbone pattern is a trend that has "Pinterest worthy" written all over it. Herringbone is a classic pattern with a bit of complexity that makes it much more interesting than the more straight-forward brick pattern. Herringbone floors can be made with wood or tile, using long rectangular pieces in either case. Light from the window reveals the hand-scraped texture on the floor in this Delhi kitchen project. Wood flooring can be given a surface texture that gives it more character, and has been trending for a number of years as people have come to value the organic quality it enhances in a wood floor. There are two primary types that are popular. Hand-scraped flooring gives the board an irregularly rigged surface, mimicking the look and feel of wood that has been casually planned by hand. Wire brushed floors are given a more rustic scratched texture that adds careful imperfections to the surface, again for that hand-touched element.